There are many different swag patterns and pattern systems available to workrooms today. They enable the workroom to create a wide variety of swag styles and sizes. Yet each pattern and system has its limitations. Some are expensive. Others lack flexibility. 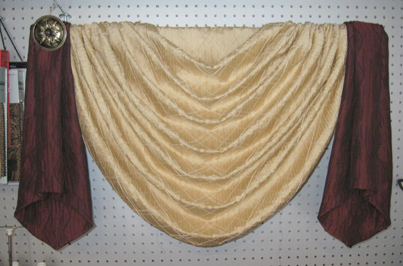 As full-service workrooms, we must be able to create swags in any requested shape, size or style. Understanding the engineering of the basic swag shape allows us to draft our own swag patterns or modify other patterns or systems to exceed their limitations. The Professional Workroom Handbook of Swags, Volume 1, is the definitive guide to understanding the engineering behind the swag pattern. The book concentrates on three most commonly used swag styles: basic Board Mount, Cutout and Point-to-Point. The most traditional and basic of all swag shapes. A graceful alternative to the basic swag, the cutout swag incorporates a decorative rod as a design detail. The most versatile of swag shapes because they can stand alone as a finished treatment or complement other treatment pieces. Over 120 pages of information from designing the treatment to drafting the pattern, sewing and installing each of the three different styles of swags. It also includes different options for trimming bulk and adding returns to a swag treatment. Finally, the last chapter is a bonus on scarf swags. Take a look through the Table of Contents. Writing this book was a journey into uncharted territory. Learning and defining the engineering concepts of swag patterns has never truly been attempted before. As such, I am still learning new things every time I fabricate a swag. The purpose of this page is to expand on the information found in the book, as well as clarify any points which were confusing or ambiguous. Once you receive your book, place the addendum page in your favorites list and check back periodically for additional information or to share some of your insights. Click here to access the Addendum page. Hi Ann! I finally had the opportunity to use your swag book and I just had to let you know that the results were fabulous! I attached a pic of one tacked to the board - perfect! I am always concerned when my fabric dictates the swags to be cut on the straight of grain, but you can't even tell, the pleats swoop so smoothly, the swags look like they're cut on the bias. I have 6 to make in 2 different sizes (the one pictured is 26" wide with 20" drop) and your book made drafting the patterns the easiest part! Thank you for writing such a comprehensive and easy to understand instructional on swags, now I never have to use that big plastic Rowley template ever again! I have to ditto Ann Middlebrook's comment about Ann Johnson's instructions. I realize everyone has adopted their own approach at making swags...but...you will NEVER go wrong using her instructions. There is no possible way the swag will turn out the wrong size. I have used purchased patterns and frankly, I don't like them. Having said that though, even if you were to use any other pattern system out there, having the knowledge that Ann shares in her publication is a great backup to whatever system you are using. In short...I highly recommend her book. Every time I do a different kind of swag, I know that I take a huge step towards a brighter, more profitable future. When I first thought of buying your book - I almost didn't because it seemed spendy but it sure has been worth every penny. It is 4 types of pattern (and every size included!). Thanks. relief there is an answer! I used your formula to re-size a pattern and I feel it turned out just great. I want to tell you how grateful I am to you for writing your book on swags. I recently had the wonderful opportunity to take some poorly made swags and remake them into something very beautiful using your book. You are so right when you say that patterns and templates have their limitations. These swags were wider and longer than the largest setting on my template. Using your book, I was able to make the swags exactly the size they needed to be. The client wanted a casual look so we didnt dress them perfectly. We could have though! I am sending along the before and after pictures. You could not imagine my delight when I realized I had the good fortune to be asked to remake these swags for a high end furniture store owners home. I knew I would be able to amaze them with the transformation because of the classes I have taken from you and the videos I have purchased (because you can only remember so much in the classes! ), as well as the book. To be able to make an oversized swag pattern from scratch takes knowledge which I have gained from attending conferences, reading your book and reading the forum. I realized that the knowledge that I have gained translates into charging more money (now to just convince interior designers of that! Thank you again for all your hard work. I cant wait for book 2 to come out! I also LOVE Ann's Swag Book--it is my bible for swags. I will never go back to any other method. Everything turns out perfect every time. I simply amaze myself sometimes, with a little help from Ann's book. I can tackle swags with confidence. Thanks Ann. Ann, I finally got a job with some swags and I got to use your book! I had to take some larger swags off a cornice and reused them to make board mounted swags. I drafted my new pattern and cut them out of the old swags. They were perfect (the fabric wasn't but that's another story!). Just thought I would let you know how much your book helped me. It was right on the money. Ann, I can't tell you how empowered I feel using your book. I feel I can handle any swag now and they come out looking sooo great. 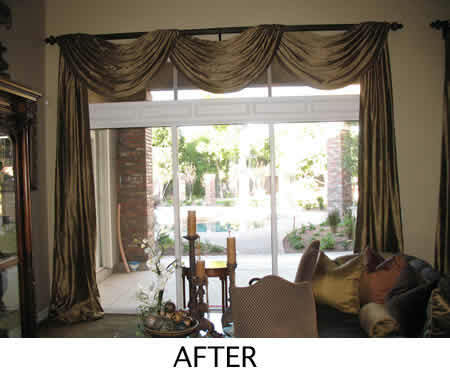 I just did a gathered swag valance and it looked so much better than my old fabricated ones from ready made patterns. Sorry to run on..but I'm thrilled. I have almost finished reading Ann Johnson's new book on swags and I just had to share my thoughts with you. To use words like PHENOMENAL, OUTSTANDING, FABULOUS just don't do justice to what she has created. It is very obvious that she has spent a lot of time in the research department. To me, the appendix charts are worth the price of the book! I Love it! Her book is one of a kind for sure and a MUST HAVE for everyone who fabricates swags, even if you already have another system and this comes from one who had and used an adjustable pattern for 16 years of my workroom career. All patterns and/or systems have their limits and this book explains how to overcome the limitations. It is extremely well written, with good terminology and easy to follow instructions. I am a firm believer that if you truly understand the why's and wherefore's of anything, then, as Clotilde once told me, "You are only limited by your imagination." I can see this book dramatically changing the learning curve on fabricating swags in this industry. The results will be far more educated workrooms who are far more valuable than they are today. Thank you, Ann, for a great blessing! Ann, I took your class and bought your swag book at the conference last Sept. Yesterday I had the oportunity to make my first pattern. I made a mock up last night and it turned out exactly how I had envisioned it. I had originally bought a pattern, but when I took it out and looked at it I knew it was not going to turn out with the look that I wanted. So I dragged out your book, my weight chain and a sample board and got to work. I figured if I blew it I could always go back to the pattern. The results are fabulous. And this is for a very expensive silk that is on its way here. I feel much more confident in tackling this job. Ann, I have just received my copy of your Professional Workroom Handbook of Swags and wanted to tell you that I am absolutely delighted. One of my biggest frustrations with all the books out there is that the instructions tell you to do something without telling you why you need to do it. I am the type of person who has to know why. You have so clearly explained both the why and how. Move over Lady Caroline Wrey and Merrick & Day! P.S. As an ex-documentation manager for major financial and data networking corporations, I also have to commend you on your writing style and layout! "The Professional Workroom Handbook of Swags, Volume 1,is a fabulously well written, thorough and even ingenious work. I am so impressed by how well Ann Johnson explains such a complicated topic. I am so impressed that one person even knows this much!" "Ann has used her extensive knowledge of the window fashion industry to write a comprehensive, easy to follow manual on the fabrication of basic swags and some of its variations. This is a "must have" for the serious-minded workroom professional as well as for anyone who is just getting into the business. Ann's swag system results in perfect swags every time without the use of expensive templates or equipment. The Appendices alone are worth the price of the book. I don't think I'll ever use the swag templates or buy another swag pattern again. That's how much I like Anns system." "Great attention to detail! Ann breaks the pattern making of swags down into minute increments that are very easy to understand. Diagrams, photographs and tips are very helpful. Information in this book is not only useful in the fabrication of swags, but in the design and selling of them. An A+!" "Finally, a book on the basics of swag fabrication that a novice can follow! I love how it addresses what are considered to be industry standards. This is everything you always wanted to know about swag fabrication and more. Its wonderful how it explains the result from choosing different fabrication techniques. It educates enough so that I can quickly and efficiently draft my own swag patterns to achieve specific results. It takes all the guesswork out of swag fabrication. One of the best features of this book is the Troubleshooting. If you make any mistakes during fabrication, it tells you how to fix them as efficiently as possible. " 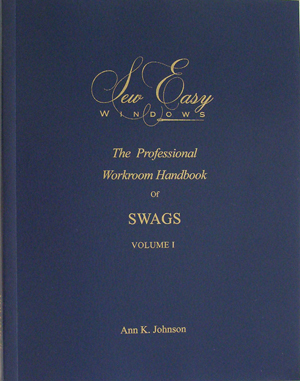 "Ann Johnson's 'The Professional Workroom Handbook of Swags Volume I' is the most comprehensive book on creating swags that I have ever encountered. 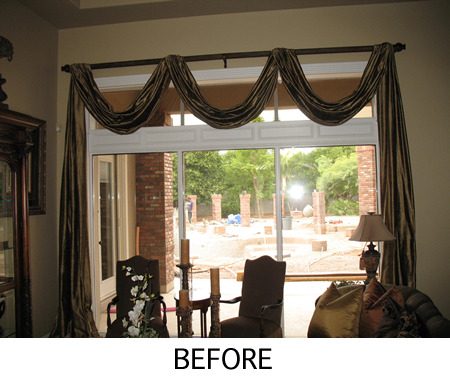 It is equally valuable to new window fashions fabricators as well as seasoned veterans. For the beginning fabricator, this book is an excellent primer on fabricating swags. It takes you from design all the way through to installation, addressing every conceivable issue that might come up. Where judgement comes into play, defaults are given to take the guess work out for newbies, while more experienced fabricators can build on their own experiences to make the best decision for their project. The reference charts for calculating yardage and the bottom curve chart for calculating trim will save you countless hours and expensive mistakes, making this an invaluable resource for fabricators as well as designers. No matter what method you are using now, you will be designing and making more beautiful swags after you purchase this book."